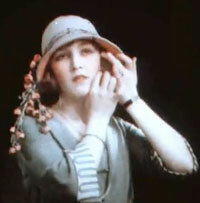 I came across this video from 1922 that was an early color film test done by Kodak on Slate. "This clip is a very early, full-color Kodachrome film made by Kodak in 1922 to test new film stock and color processing. It is a lovely little four-and-a-half minutes of pretty actresses gesturing for the camera. The color and lighting are exquisite—all warm reds with flattering highlights—making it a purely enjoyable thing to watch." It's not only gesturing though, it is acting using expression and motion. Seeing it in color really brings it to life and, for me, highlights the difference between expression then and expression now as well as how much can be conveyed without words. The article also has a link to a DVD that is an analysis of body language in film which looks pretty cool as well.